Pear walked down the aisle under the clear blue sky, dotted with perfectly fluffy clouds. Less than two hours earlier, it had been torrentially raining, but it was as if nature was just purging its humidity to make way for a gorgeous ceremony. The gold water pouring tables for their traditional Thai water ceremony glinted in the sun and guests faced a backdrop of hills and grape vines. Their friend who had introduced them in the first place officiated the ceremony and made it a point to say that the day of celebration had been a long time coming. Roughly nine years to be more precise. From the time they first met until that moment standing in the sun, he said they were like two little turtles slowly making their way towards each other. It was only fitting that they made their vows back where everything started. Pear and Phuong’s wedding was packed with unique details that blended traditions, old and new. 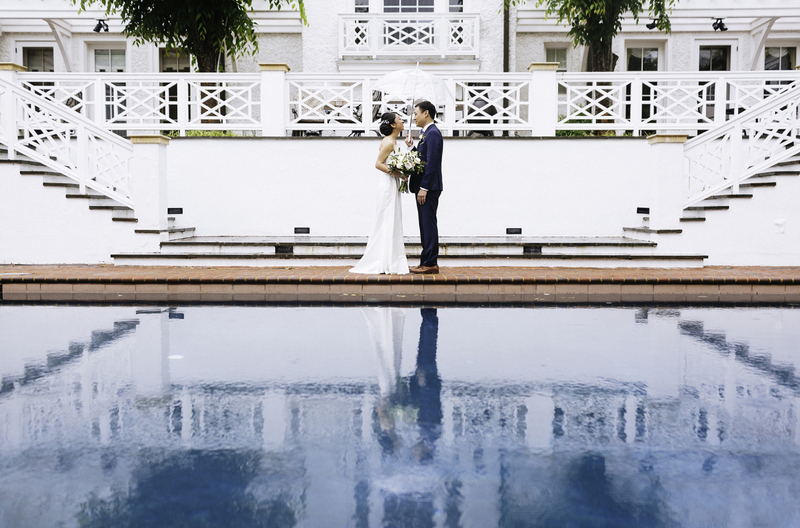 Pear’s custom-made, Thai-inspired wedding gown featured a lace sabai that draped elegantly over her shoulder. All the guests had a chance to answer (very hard) trivia questions on an app made by a bridesmaid. They greeted tables in traditional Vietnamese ao dai and ao gam. Finally, they topped off the night by belting out the Back Street Boys and pouring sweet wine into their mouths with Spanish Porrons. It doesn’t get much better. Greatest thanks to Bethany Snyder Photography for tag teaming this one with me.